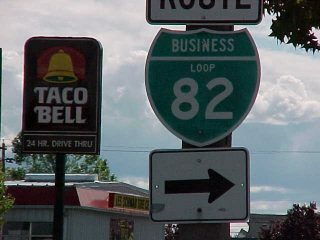 Two business routes previously connected with Interstate 82 in Washington state. 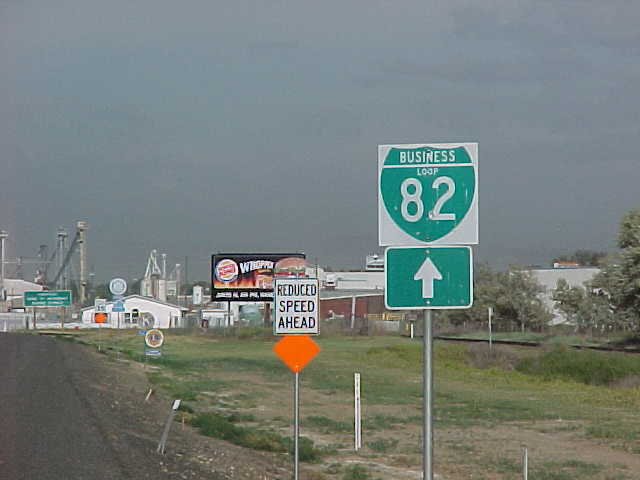 Partially a locally maintained route, the business route for I-82 through Yakima followed 1st Street (old U.S. 97) south from the interchange complex (Exit 31B) joining Interstate 82 with the U.S. 12 freeway toward the Yakima city center. The route circumvented downtown as a truck route using the couplet of Lincoln Avenue (west) and Martin Luther King, Jr. Boulevard (east) to North 8th Street. 8th Street led the route south to Yakima Avenue for the return to Interstate 82 at Exit 33. Some signs were still posted along the route in May 1999. A lone overhead remained as of 2012.
Business Loop I-82 traveled 6.5 miles east through Sunnyside from Exit 63 near the community of Outlook. Sunnyside Road connected the business loop west end with Yakima Valley Highway (old U.S. 12) leading east into the city. The eastern section of the former route constitutes a commercial boulevard from Mid Valley Mall southeast to Washington 241 (Waneta Road), which returned the loop to I-82 at Exit 69. 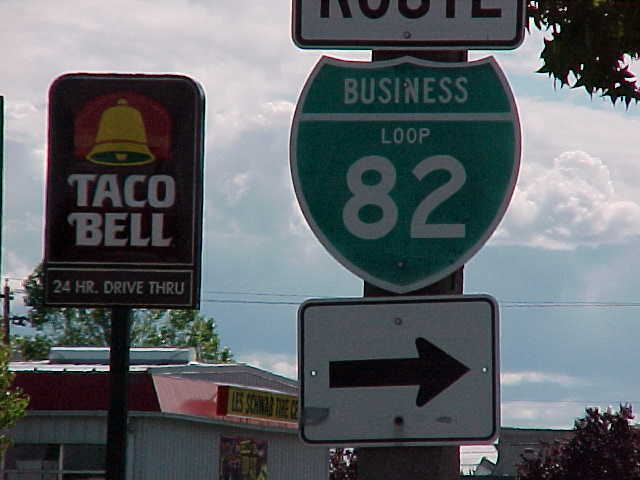 One or more Business Loop I-82 shields were still posted along old U.S. 12 in the Sunnyside area as of summer 1997. A lone marker remained through at least 2012. Page updated August 26, 2016. 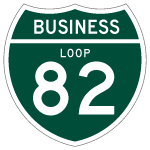 Long since removed, this Business Loop I-82 directed motorists onto North 8th Street from Yakima Avenue west. Photo taken by Mark Bozanich (2000). 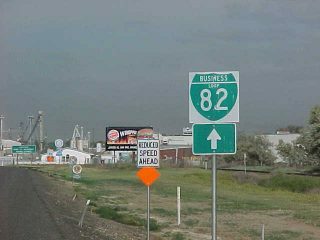 A remaining shield for Business Loop I-82 east along Yakima Valley Highway as it entered the city of Sunnyside. Photo taken by Mark Bozanich (2000).